My awesome and honest review of: Cyberace. 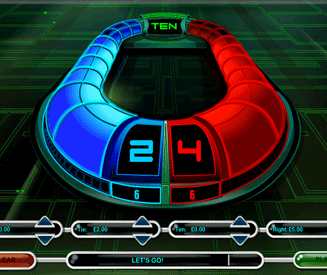 Cyberace is essentially a racing game using numbers. However, it’s a bit of a stretch to call it a proper racing game, so I’m going to lump it in to the numbers games section for now. In Cyberace there is a red column and a blue column. Each column will take it in turns to roll a number between 1 and 4. The column that makes it the furthest after 3 rolls will win the game. 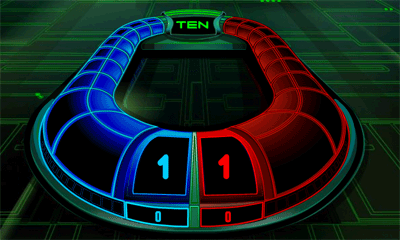 You can wager on which player you think will win the game, or whether either of them will make it to 10. It’s a fair effort, but ultimately Cyberace is an uninspiring game at best. My score for this game - 23%. At first I thought Cyberace was pretty cool. Despite the limited number of betting options I enjoyed the tension as you hope that the team/player/column (whatever it is) you’ve bet on will out-roll the other team. However, once you realise that is actually a racing game at the end of the day, it’s pretty poor. If I think about it, there is no reason why you would want to play Cyberace over a game like Virtual Dogs. They are both racing games at their core and Virtual Dogs absolutely destroys Cyberace in that respect. If you prefer very simple race-style games and you love numbers more than animals, then maybe you’ll find Cyberace quite fun. For everyone else though, stick with Virtual Dogs. The basics idea of Cyberace. Watch two teams spin a number and hope for the best - that’s all there is to it. They could have at least tried to throw a few more pretty colours in to the game. It would be cool if you could assume the role of one of the teams and roll the numbers for yourself, but that doesn’t happen either. A detailed guide to the rules. There are two columns in Cyberace, but from now on I’m going to refer to them as "teams". Each team takes it in turns to spin a number in the central section. The numbers range from 1 to 4. Each team will spin a number three times. For every number that is rolled, the team will move that number of sections up their column. The team with a highest total at the end of the game wins the race. Note: If a team makes it to 10 they do not automatically win. If both teams make it to 10 (or more), the race is a draw. Cyberace betting options and payouts. There are four main betting options in Cyberace. Blue Team wins = 2x. Wager that the Blue Team will win the race. Red Team wins = 2x. Wager that the Red Team will win the race. Tie = 6x. Wager that both teams will have an equal score at the end of the race. Ten = 8x. Wager that at least one team will score 10 or more by the end of the race. Both teams have an equal chance of winning so they payouts for betting on either Red or Blue is the same. And that’s about it. The betting options are incredibly limited, but at least you get to wager on more than one outcome at a time. Even so, that doesn’t really do much to improve the excitement. I wish I had more to write about this game but this as far as it goes. Enjoy it if you can.